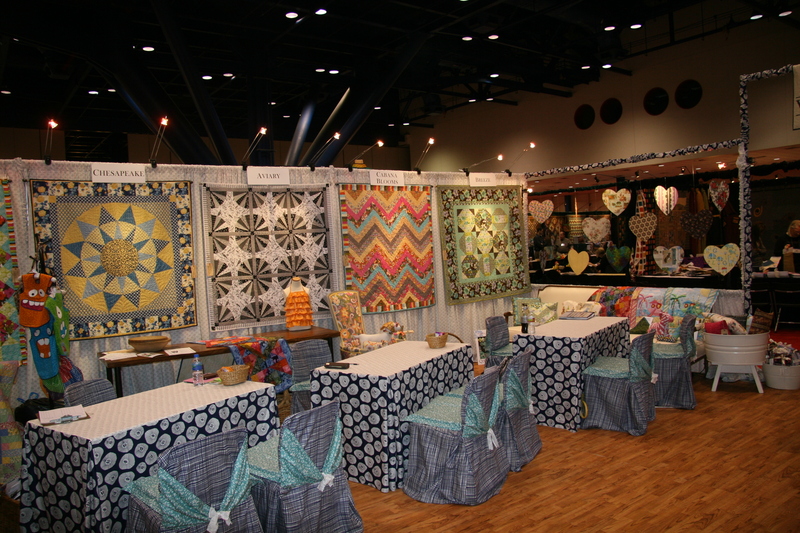 Hello everyone, I am finally back from another AMAZING International Quilt Market in good old Houston, Texas. 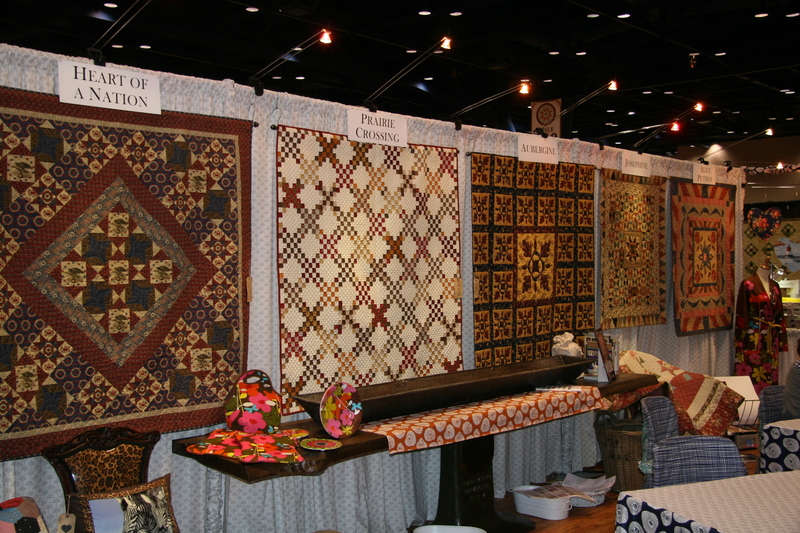 This year we had such a SUPER response to so many of our fall 2011 collections. All I have to say is WOW, WOW and more WOW!!!! 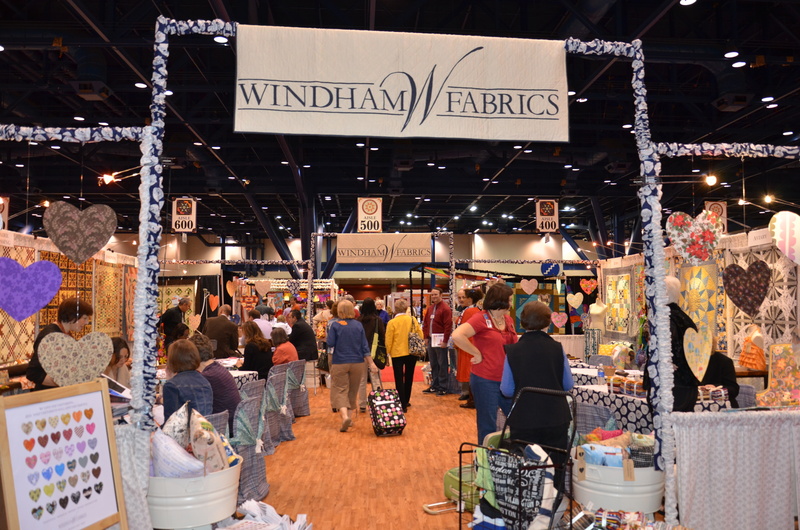 This year the Windham Fabrics booth took on a new type of persona. The booth in general had a more MODERN VIBE showcasing a bunch of more contemporary collections. 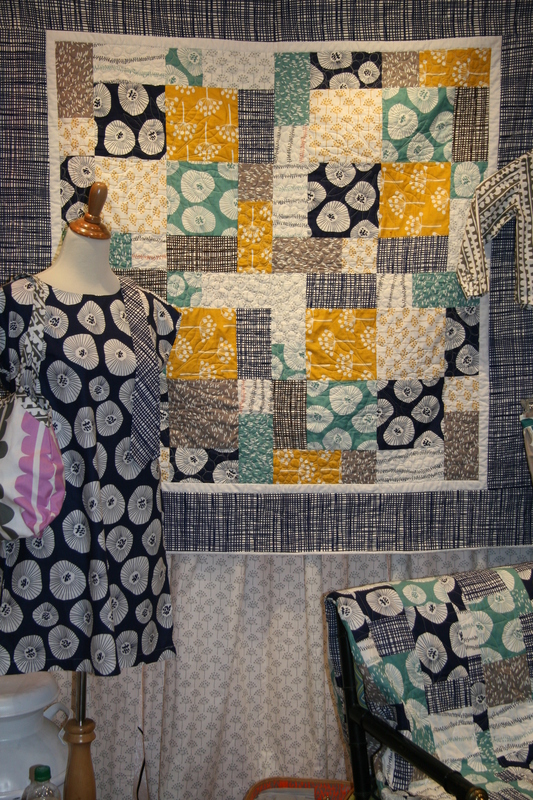 I am sure you all have heard the buzz about The Premier Collection by Lotta Jansdotter. The Premier Collection is Lotta’s first fabric collection and I would say it is a HOMERUN!!! I personally love her choice of color. 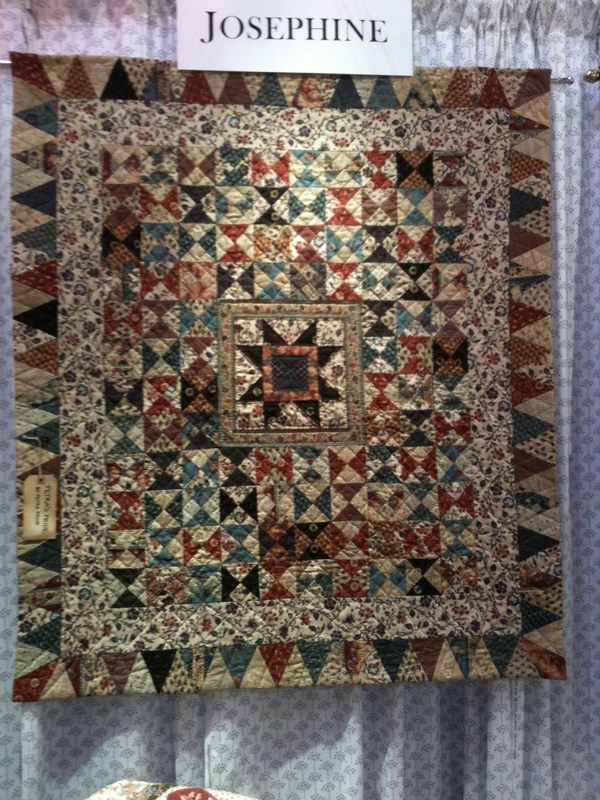 You can see how nice the colors and patterns work together in John Kubiniec’s quilt shown below! Another FABULOUS new designer, Melissa Ybarra has joined the Windham team. 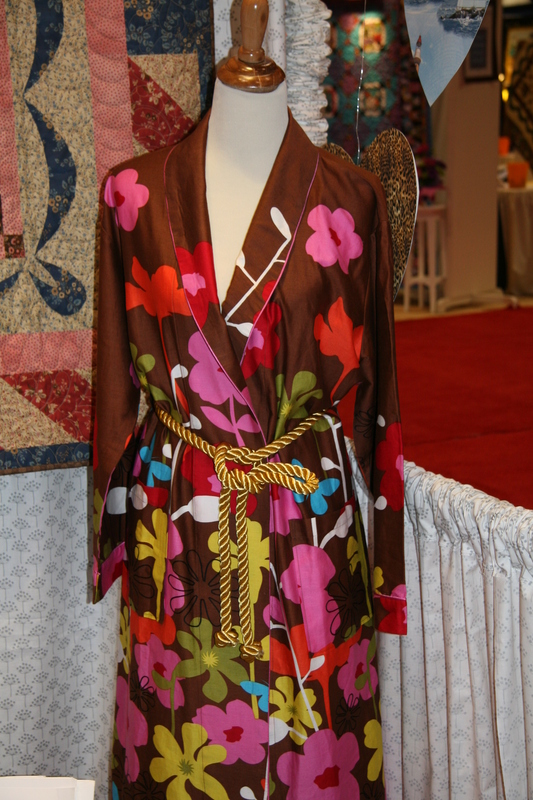 Melissa has absolutely WOWED the fabric world with her first collection Cabana Blooms. This collection has a special panache with its modern color palette and hip floral designs. I think Melissa has a lot to offer the textile world and I must admit I can’t wait to see what Melissa has in store for us in the future!!!!! 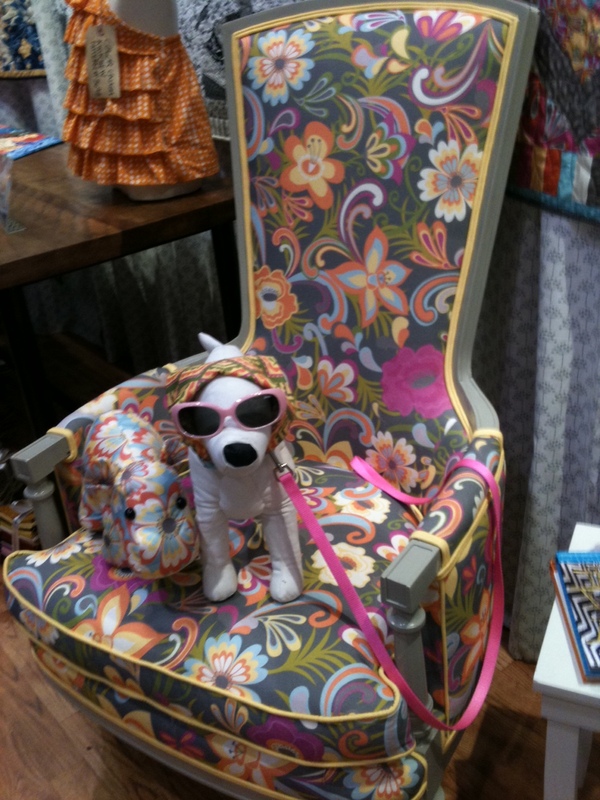 I LOVE this chair Melissa made out of some of her Cabana Blooms fabric. 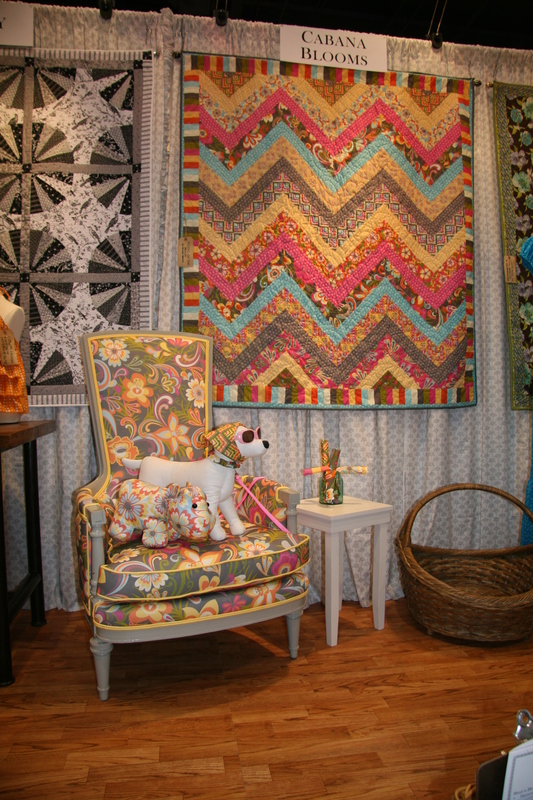 What a great way to freshen up old furniture by reupholstering it with some new, funky fabrics!! 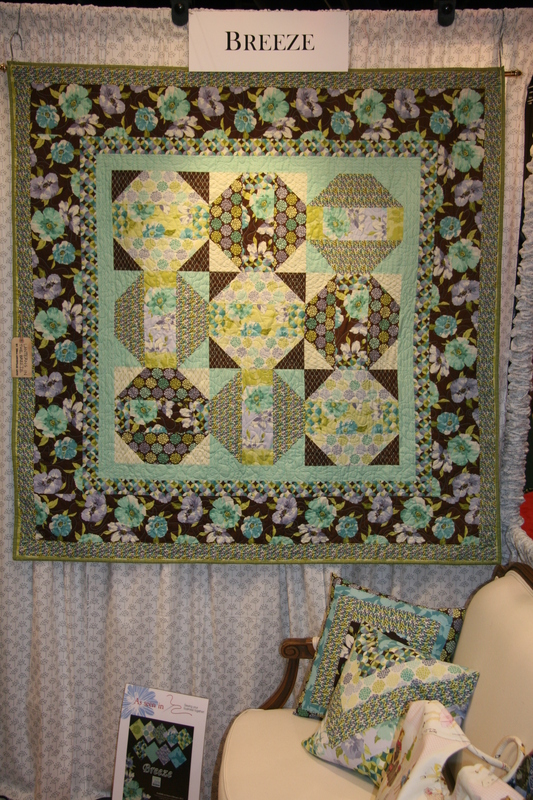 Shadow Flower by Jackie Shaprio of French Bull designs is also a very cool, modern collection to hit the fabric scene. I absolutely AODORE how she mixes bright blues, greens, and pinks with deep chocolate browns! I must admit our booth turned out SO GREAT !! For your viewing pleasure…Here are some more pictures of a few of our AMAZING fall collections as well as pictures of our FABULOUS booth! 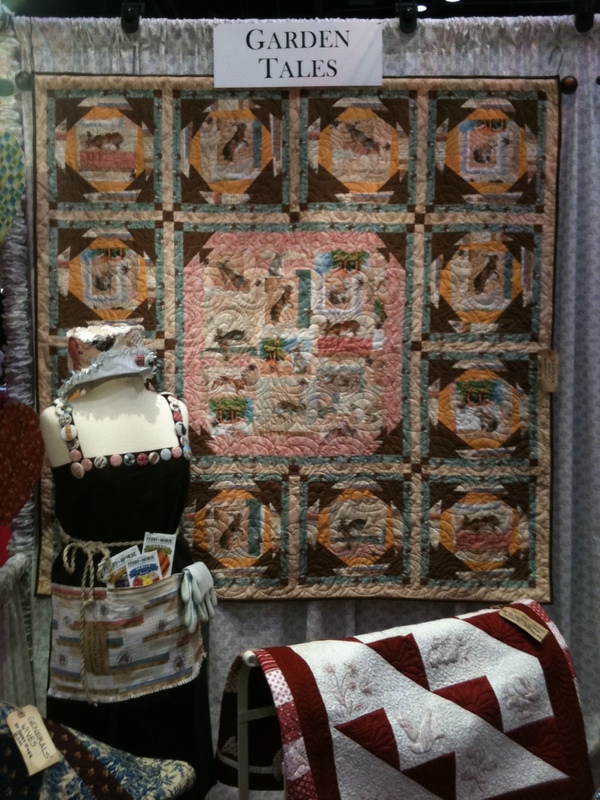 This year Windham Fabrics hosted TWO TERRIFFIC Schoolhouse events. 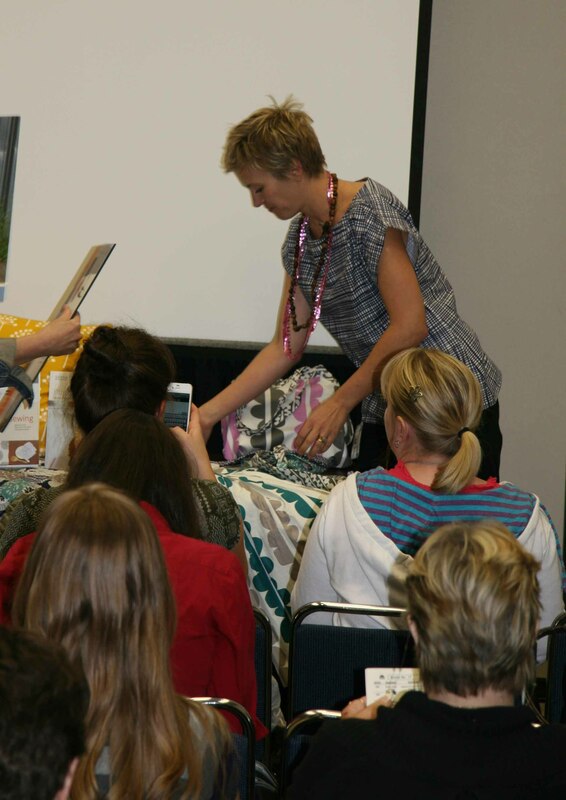 If you are not familiar with what Schoolhouse is, it is a bunch of small seminars that range from 15-30 minutes long on a variety of topics pertaining to quilting, fabric and the design process! Lotta Jansdotter was the first of our two scheduled Schoolhouses. She spoke about her personal experiences and thought process when designing a new collection. The turnout was huge and EVERY SEAT WAS FILLED! After Lotta, we had another Schoolhouse from the ADORABLE and FUNNY Debbie Johnson and Kim Suleman authors of “Canny Keepsakes” books. The main theme of their Schoolhouse was centered on creating visual displays. Here are Florie and Betty!! 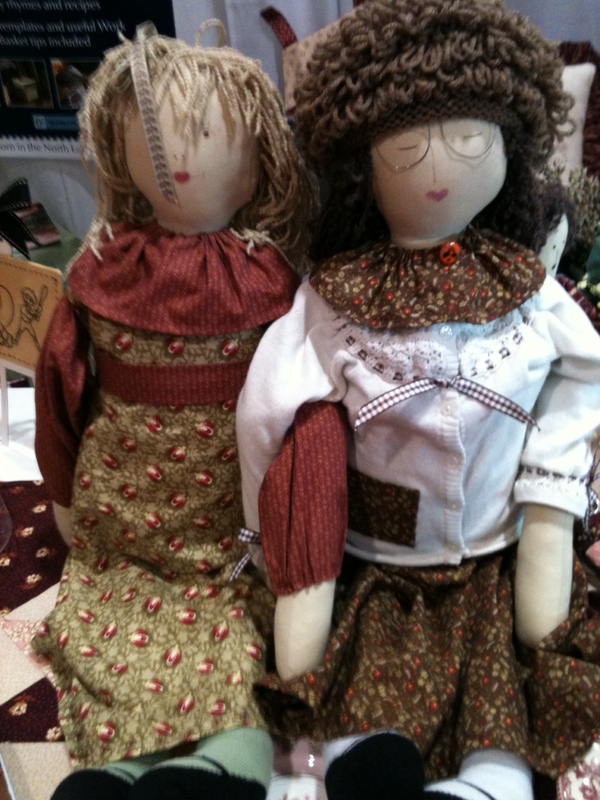 Both dolls where made out of the American Spirit fabric collection! I would like to finish by giving credit to the entire Windham Fabrics team. 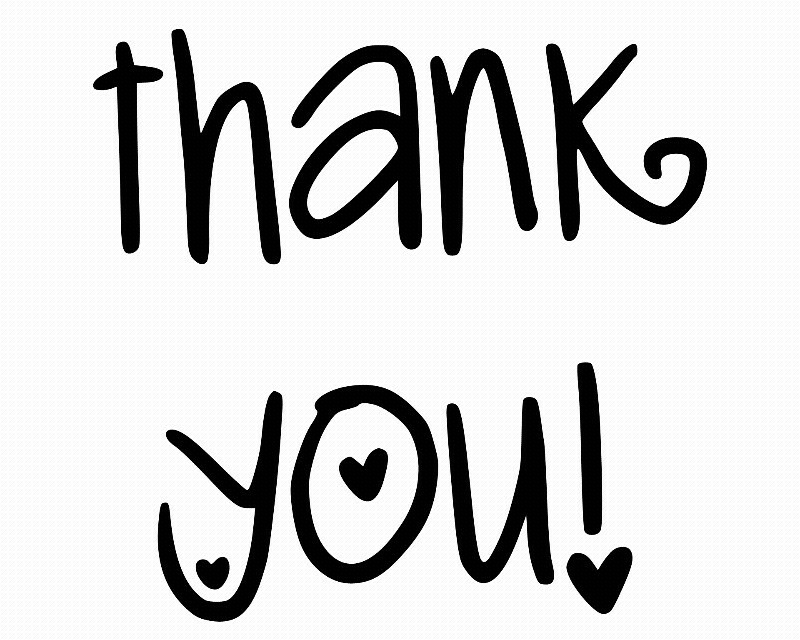 Without the WONDERFUL efforts from the whole staff we would have not been able to have such a successful show! All in all, the show was inspirational, fun, full of creativity and most of all a HUGE success. So glad I had the opportunity to have met so many of you! wow! I love seeing it all. You’re so right, the modern vibe that Windham has picked up is awesome!! I LOVE ECHO, Rosemary Lavin, Hoodie, Bari Ackerman, also the older more traditional lines. 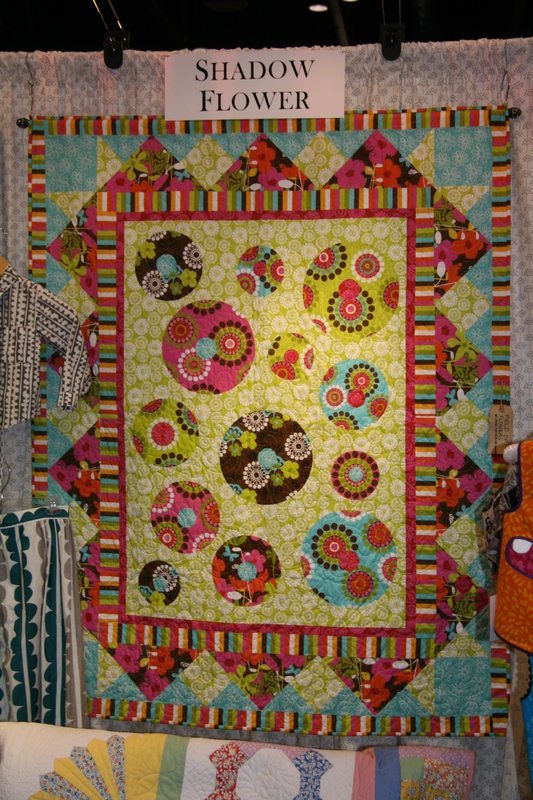 Your fabric lines are varied and fabulous, I’m a huge fan! I love that upholstered chair. What fun market must be. Thanks for all the feedback. I love when everyone takes a moment to share!